On a steamy Saturday morning in May, a line of people is forming in front of a booth for Suryana Cuisine. Residents of Clarkston, Georgia, and those who have popped in from the neighboring city of Atlanta, eye the silken hummus, the falafel being dropped into the fryer, and a bright tabbouleh salad. Behind the table, a young Syrian man named Malek Alarmash, his sister Rouaa, and his mother Majeda Nakshbandi work in the kind of effortless syncopation only a family can — Rouaa takes orders and payment, Malek chats with passersby while making falafel, and Majeda greets guests with a smile as she prepares the wraps and salads with culinary dexterity. At the first Fresh Harvest Artisan Market in Clarkston, this Syrian food stand is a great success. From 10 to 2, people with accents sprawling from around the world intermingle with Southern drawls, maintaining a steady stream of business for Suryana Cuisine and their fellow vendors—a broad mix of local farmers, artisans, and food purveyors. Clarkston, Georgia has been home to tens of thousands of refugees over the past four decades, relocated from Vietnam, Sudan, Bhutan, Somalia and many other nations. The small town of Clarkston is sometimes touted as the one of the world’s most diverse square miles. As Alarmash and his family hand off the last of their hummus and drop the last falafel in the fryer, he reflects on the relief he feels to be here, now. Alarmash was born and raised in the Syrian capital of Damascus. He was a college student when the revolution broke out. The young man found himself in jail twice—once for protesting the current government, and a second time for simply arguing with a university employee. While imprisoned the second time, he was forced to sign a paper promising to spy on his classmates, friends, and fellow members of the opposition. His family hastily began a plan to flee the country. They emigrated first to Jordan, where they spent three years. When the opportunity presented itself, they boarded a plane for the United States in August of 2016. After all of his paperwork was in order and he, his mother, father, and sister had become more acquainted with their new home, Alarmash began working at Refuge Coffee. The coffee shop, housed in an old gas station, was founded in 2014 as a place for the residents to commune, but it also offers opportunities for refugees. Although Alarmash and his younger sister Rouaa adjusted quickly to their new city, the transition was difficult on his parents. His father is physically disabled, and without knowing English, his mother Majeda often felt isolated. Alarmash began to brainstorm solutions: what if his mother could connect, as he had, by sharing her food? Drawing from his experience at Refuge Coffee, Malek wanted to launch a business that could facilitate connection for his mother and fellow refugee women. Suryana Cuisine was born. The business helped create a healthy place for his mother and other Syrian women to work, cultivating community and a sense of agency. “[Being] able to work, that makes me feel more independent and at home,” says Nakshbandi. In their first year of business, Suryana Cuisine has fed more than 1200 people. Together the mother and son duo (and occasionally Nakshbandi’s daughter) cater events and serve traditional Syrian food at markets throughout Clarkston and Atlanta. Their business has seen rapid success, and it’s easy to see why—the food is delicious but with Malek’s vivacious charisma, even more people are drawn to it. For Alarmash, the scope of his success had less to do with the food sold or events catered, and more with what the project has meant to his mother. She and Alarmash are busier all the time. When they can, they hire women from their community to help, though they dream of being able to provide other female refugees with a full time income. 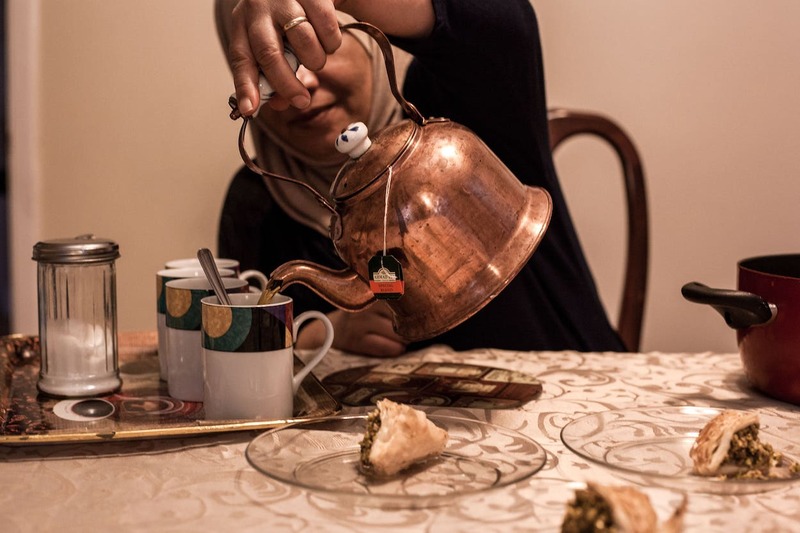 While American political leaders continue to vocalize and enact increasingly hostile and violent policies towards Muslim refugees, the family behind Suryana Cuisine remain perseverant; dedicated to uplifting their community and sharing gratitude through food. Jodi Cash is an Atlanta-based journalist whose worked is fueled by her love of conversation. She co-founded The Seed & Plate, an online publication about food, farming and community, and she’s working on a documentary about 1970s pot smugglers. Otherwise, she relishes a life of adventure with her husband, Gresham.